高斌, 张涛. 银川市1970-2014年鼠疫自然疫源地调查结果分析[J]. 中国媒介生物学及控制杂志, 2018, 29(6): 654-656. GAO Bin, ZHANG Tao. Analysis of the results of the investigation of plague natural foci in Yinchuan during 1970-2014[J]. Chin J Vector Biol & Control, 2018, 29(6): 654-656. Corresponding author: ZHANG Tao, Email:melody68man@163.com. Abstract: Objective Animal plague survey data in Yinchuan city form 1970 to 2014 were analyzed to provide scientific guidance for the prevention and control of plague in this area. Methods The main host density of Yersinia pestis was investigated by pit clamp method. The nocturnal rodents were investigated by 5-meter or 5 meter clamp line method. The investigation of body fleas in rodents was carried out by combing their body surface. Pathogenic detection of plague was conducted by culturing rodent organs and taking liver and spleen tissue imprint. Forms were designed data of plague survey were collected, and a database was established in Yinchuan for 1970-2014. 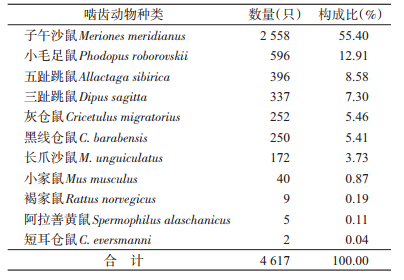 Results In Yinchuan city, area of 4 043 hm2 was sampled, 6 369 rodents were captured during 1970-2014. The annual average density of Meriones unguiculatus was 1.58/hm2 (0.10-3.34); We put 164 394 nocturnal mouse traps, and 13 572 rodents were captured, the average capture rate was 8.26% (2.17%-12.13%), and the number of nocturnal rodents changed greatly from year to year. A total of 25 038 rodents were examined and 7 000 of which carried flea on their body surface. The average flea rate was 27.96%, and the average flea index was 0.98 (0.09-2.84). In the past 44 years, 44 strains of Yersinia pestis were isolated, of which 37 were detected by animals, and 7 strains were isolated from the fleas. In total, 5 453 serum samples were detected by indirect hemagglutination method (IHA), and 15 of which were positive. Conclusion In Yinchuan, M. unguiculatus plague foci only distributed in Tonggui town and Yueyahu township. Especially M. unguiculatus and M. meridianus were predominant species in the Yueyahu town ship, Xenopsylla conformis conformis is still the predominant flea, plague natural foci will be of long existence. 丛显斌, 殷文武. 鼠疫防控应急手册[M]. 北京: 北京大学医学出版社, 2009: 311-312. 孙志文, 屈彦. 宁夏回族自治区资源环境地图集[M]. 北京: 中国地图出版社, 2006: 102-103. 张涛, 李丽, 赵建华. 鼠疫自然疫源地学说的探讨[J]. 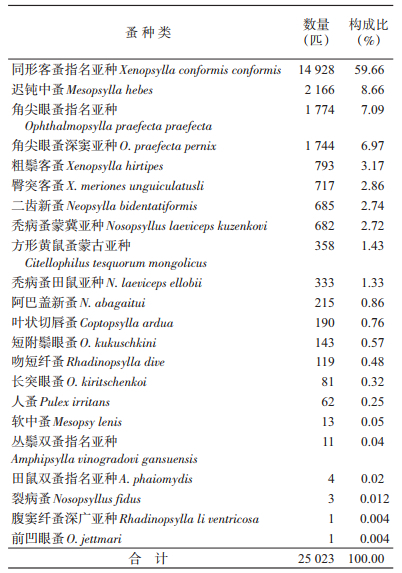 中国媒介生物学及控制杂志, 2013, 24(3): 283-284.